Bonzah.com - That Covered Feeling! 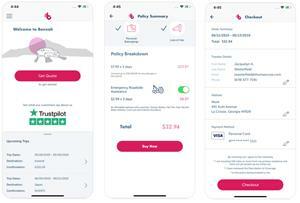 /EIN News/ -- Des Moines, Iowa – April, 2019 – Pablow, Inc. (Pablow), an innovative Insurtech startup focused on improving access to and utilization of car rental insurance globally, is pleased to announce the immediate availability of Rental Car Damage Insurance app via the App Store. Car ownership is declining! It’s estimated that new car purchases will decrease by 28% by 2030, in major US cities. Whereas car rentals and other on-demand transport options are estimated to account for 50% of all passenger miles by 2025 as opposed to owned vehicles, according to Bloomberg. Bonzah.com is gearing up to enable travel planners to take advantage when staff are taking a trip 100 miles or more from home and up to a maximum of 31 days.